Cycling through the Arboretum, I came across rolling oceans of poplar fluff! It looks like the grass is losing the battle here. 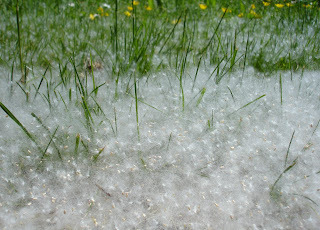 Poplars (cottonwoods) shed these wonderful cottony seeds, and there must be a large volume of the trees in the area to provide for this amount of fluff.